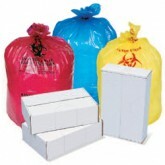 Pitt Plastics offers color coded, printed bags for Infectious Waste, Infectious Linen and Non-contagious Linen management. Our printed Stock Isolation Bags are imprinted with English and Spanish to help ensure complete understanding for safety and proper use. Complete sanitary management is available in Linear Low from Pitt Plastics. They are available in a full range of sizes and strengths as well as featuring the multi-layered star seal. Our Linear Low Isolation bags start with top quality resins and are carefully constructed to provide greater film strength. This added film strength yields a bag with superior puncture and tear resistance.